Many birders experience great excitement at the prospect of 'seawatching' (a term by which seabird-watching is colloquially known), and seldom miss the opportunity to partake in this. It may be performed on a holiday ferry crossing accompanied by the family or friends, by a chartered pelagic tour with fellow birders, during a hitch on a fishing vessel, or from a headland on a windy day. Regardless of where it is done, it is impossible to describe in words the feeling of excitement and drama during a great seawatching day. You have to experience it yourself! Furthermore, seawatching is - for many keen birdwatchers - also coupled with the greatest identification challenges in modern field ornithology! 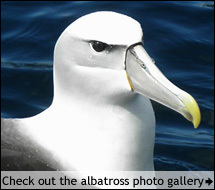 Add to this the often unpredictable, occurrence of seabirds as well the difficulty to know in advance how many species or what numbers you are going to see on a day at sea or at a coastal spot. Well, I hope that you will find this web site covering a few selected seawatching sites both enjoyable and useful! New Zealand - what a great trip! This website is owned and managed by Niklas Holmström, Sweden.